On October 21st 1991, while preparing to mine gypsum, Stanley McMullin, a heavy equipment operator unearthed large teeth, a tusk and bones. 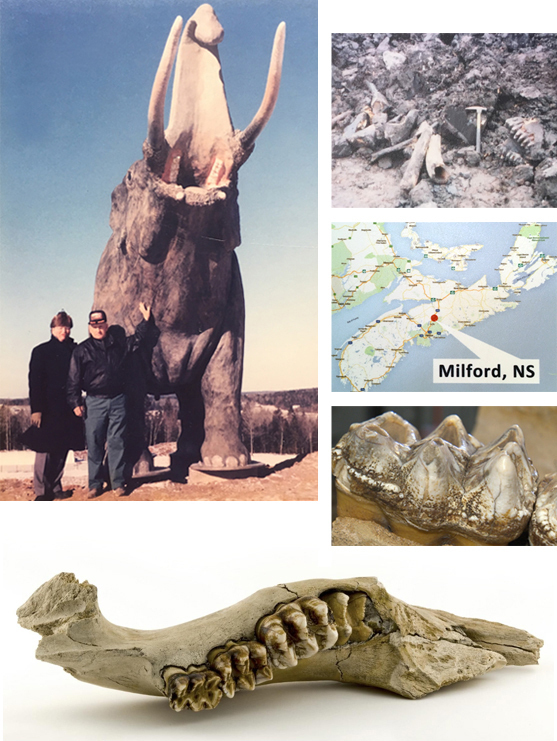 The discovery was made at the National Gypsum Quarry in Milford, Nova Scotia, about 15 km from Mastodon Ridge. Work was immediately halted and the Nova Scotia Museum contacted. Upon visiting the site, archeologists identified the bones as those of a mastodon. The next day, a full-scale recovery plan went into effect and over a ten month period all remains, including much of the surrounding clay, was taken to the museum. At the museum, the bones were carefully cleaned, preserved and catalogued. In addition to the mastodon remains, traces of other plants and animals were recovered from the surrounding clay. Pictured is a photograph of the owner of Mastodon Ridge, Bill Hay, with Stanley McMullin, the man who discovered the mastodon bones, standing next to the mastodon replica in 1995. Based on the scientific analysis to date, the bones from the mastodon are believed to be about 80,000 years old, from a male animal, approximately 22 years of age, which died early in the Spring. The site containing the mastodon was a partially excavated, clay-filled sinkhole in the gypsum quarry. The mastodon was situated halfway up the exposed mud-wall. It was decided to recover all the visible bones in the mud-wall and from the pile of previously removed material. The quarry was rugged and muddy. Due to difficult conditions at the site the excavation was carried out through the winter under a temporary shelter. Over the next ten months all the remains, including much of the surrounding clay, was taken to the museum. At the museum, the bones were carefully cleaned, preserved and catalogued. Blocks of clay were dug out, and once their location was documented, they were bagged, boxed and prepared for shipping to students. Over four and a half tonnes of clay-filled boxes were shipped in containers to schools across Nova Scotia. The most intriguing find was by a Grade 6 class from Northport Consolidated School, who found a juvenile painted turtle, with flesh still on its head and front limbs. It is thought the animal was part of a herd, since a juvenile mastodon was also found at the same site. In addition to the mastodon remains, traces of other plants and animals were recovered from the surrounding clay. It is speculated that the herd may have gathered at the gypsum site for the minerals in the soil, much like the elephants of today which are known to seek out minerals and salt deposits. © Copyright - Mastodon Ridge Developments Ltd.